As Einstein famously noted in reference to relativity, put your hand on a hot stove for a minute, and it seems like an hour but sit with a pretty girl for an hour, and it seems like a minute. Time is rigid, immutable. Immune to our machinations it marches by (or do we march through it?) with no regard for our attempts to manipulate it. Why then does it seem so flexible? Why, as I pass the halfway mark in my expected lifespan, does it seem that the minutes stretch out but the months vanish as if they were never there? In Time Warped: Unlocking The Mysteries of Time Perception Claudia Hammond, presenter of BBC Radio 4’s All In The Mind series takes a look at the working’s of our grey matter to discern what causes our subjective view of such a fundamental part of our existence to vary so wildly. Thanks to her experience on the radio and psychology background, Hammond has a wealth of knowledge from which to draw when it comes to her subject matter. Through the course of the book she bombards you with study after study demonstrating just how precarious our grasp on time really is. For example, were you aware that if you believe that people have a high opinion of you then time will seem to pass far quicker? Yes, experimental evidence confirms that something as simple as our self-esteem can have a dramatic effect on subjective timespans. Or consider this simple thought experiment. Imagine it’s the weekend. You had a meeting scheduled for Wednesday but you hear that it’s been “moved forward two days”. Is the meeting on Monday or Friday? Your answer determines whether you see yourself as moving through time or time as marching inexorably toward you. This in turn has quite the effect on your general outlook on life and mental well-being. Through these and countless other examples, Time Warped does its best to get to the bottom of such strange findings. The subject matter is pretty expansive so it seems meandering at times but it’s always eventually dragged back to the point. And it’s not all just theoretical musings. In the closing chapter Hammond lists eight problems which people may experience in terms of their perceptions of time’s passing – passing too slowly, too quickly, etc – and suggests practical methods to counter them. One minor niggle I had was with the author’s obsession with their own pet theory, the ‘holiday paradox’. You know how time flashes by while on holiday but once you’re back home it seems like you were away forever? Of course you do, everyone does. yet Hammond seems to think she just discovered it and rarely lets more than 10 pages go by without at least one mention of ‘her’ paradox. But hey, she’s the author so she gets to big herself up. It’s small beer when compared to the bulk of a book which does an admirable job of tackling a subject which could easily have taken up several books rather than just one. 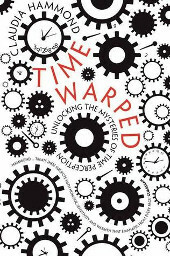 While I would have preferred a more in-depth treatment, Time Warped is a great read for anyone with a casual interest in how our brains handle the fourth dimension.